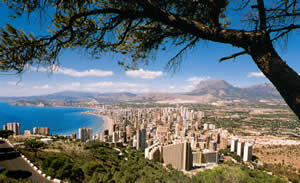 Benidorm’s beaches and many leisure facilities has made it the Costa Blanca’s main tourist area. It boasts some of the best beaches in Europe, with 3 miles of fine sand which is cleaned daily, the quality of the services and activities, and the clear water being the main reasons why it attracts so many visitors. Since the 1950’s Benidorm has changed dramatically in its appearance, once a small fishing village it is now a sprawl of skyscrapers and hotels. Benidorm has cleaned up its act since the 80’s and now the young British holiday makers and ‘larger louts’ who gave it a bad name are no longer the majority of the tourists to this town. Now you will find more and more elderly holiday makers from England, Germany and Northern Spain come to Benidorm. The Playa de Levante (the sunrise beach) is located 2 kilometres from the old town centre, the Sierra Gelada and the Ricón de Loix. The Playa de Poniente (the sunset beach) is located on the edge of the old town centre, near the Finestrat cove. There is also a smaller bay between the two main beaches and another smaller beach at La Cala de Finestrat. The historical centre is located around the Canfali vantage point, which is the most emblematic image of Benidorm with a white stone balcony and a vantage point. All tastes and activities are catered for: gastronomy, music, culture, excursions through the region and cinema. Walks can be taken in the Parque de Elche, excursions taken to the Sierra Gelada, you can go swimming on the best beaches of the Costa Blanca, go to the cinema, visit the Aquatic Park, eat and drink in restaurants for all budgets, and practise sports such as sailing and diving and also enjoy the nightlife.